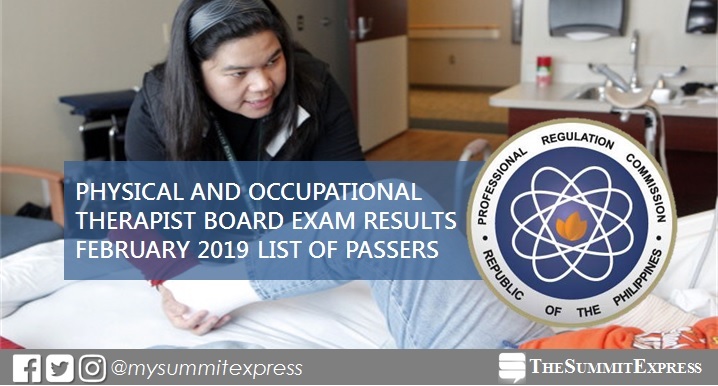 MANILA, Philippines – The February 2019 Physical Therapist (PT) and Occupational Therapist (OT) board exam results to include the list of passers, top 10 (topnotchers), top performing schools and performance of schools are released online today, February 7, 2019 or in two (2) working days after the exam. The Professional Regulation Commission (PRC) and the Board of Physical and Occupational Therapy conducted the licensure exam in Manila and Cebu on February 3 and 4, 2019. According to PRC Resolution No. 1127, the target date of release of Physical and Occupational therapist board exam results is on Thursday, February 7, 2019 or in two (2) working days after the exam. In the same period last year, PRC announced results in just two (2) working days. PRC named 588 out of 1,017 passed the Physical Therapist Licensure Examination and 139 out of 212 passed the Occupational Therapist Licensure Examination.